Westward ho? 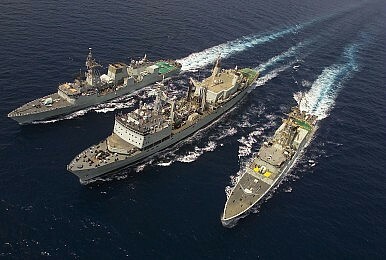 Scuttlebutt has it that the Royal Canadian Navy (RCN) may undertake a Pacific pivot of its own. At present most RCN assets are based in Halifax, Nova Scotia, imparting a distinctly North Atlantic flair to Canadian maritime strategy. The navy currently keeps seven frigates and two destroyers on the Atlantic coast, five frigates and a destroyer at Esquimalt, the port of Victoria, British Columbia. It also fields two combat logistics ships, essential for sustaining task forces at sea across intercontinental distances. Four diesel submarines acquired from the Royal Navy round out the order of battle. What strategic features can and should the RCN control? To start fashioning strategy, look at the map. The naval command should take a back-to-basics look at Canada's geographic surroundings, asking itself which waters and strategic features it would be desirable to control or influence, and the degree to which the RCN can do so with its existing fleet. That means peering not just eastward into the Atlantic deep or westward across the Pacific, but northward toward an increasingly navigable Arctic Ocean. A new theater of operations is opening of its own volition as the ice recedes. Arctic waters lap against Canadian shores, moreover, moving the polar ocean up Ottawa's priorities list. Forward-deploying forces to the Western Pacific would mean subtracting forces from a vital, potentially contested expanse close to home. Which theaters are primary, which are secondary? Commanders and naval officials should crack open their copies of Clausewitz, in particular the passages covering centers of gravity, concentration of effort and resources, and primary and secondary theaters. With such lean resources at its disposal, Ottawa must apportion fleet units wisely or thin them out into irrelevance. Forces that try to accomplish everything, everywhere, typically end up accomplishing little, anywhere. That means setting priorities among the eastern, northern, and western oceans and sticking to them ruthlessly. Which expanse is most important? Does either of the less critical expanses promise "exceptionally rewarding" gains, in Clausewitz's words, warranting a diversion of scarce resources? Does Canada command such "decisive superiority" in the main theater that it can spare units from that theater, and can do so without risking too much where it counts the most? If not, Clausewitz would counsel eschewing the effort. Does the RCN have the fleet it needs? Corbett partitions navies into the battle fleet, cruisers, and the flotilla. The RCN fleet is composed of such light warships, and its numbers are so limited, that Corbett would probably classify the whole thing as a cruiser force. Such a force is capable of exploiting command of the sea once the battle fleet wins it, but it has to wait until the enemy main fleet has been vanquished before getting to work. The RCN appears equal to the challenges it may face in the Atlantic and Arctic, but it could do little in the Pacific during wartime except act as an adjunct to the U.S. Seventh Fleet. Forward-deploying the submarine fleet to the Western Pacific is an option worth exploring, but the surface fleet probably ought to remain close to home except for peacetime diplomatic functions. Is a division of labor with allies feasible? A snappy frigate daubed in the RCN's sea-green paint called at Newport a year or two back. Its visit hints at possibilities for allied strategy. RCN leaders should consider whether tending to Atlantic or Arctic security represents Canada's best contribution to the Pacific balance. These are tranquil waters relative to the Western Pacific and China seas. The more the RCN does close to home, the less the U.S. Navy, Marine Corps, and Coast Guard have to. Easing the burden on U.S. forces would let Washington concentrate heavy forces in maritime Asia, close to likely scenes of action. Ottawa, Washington, and the rest of the NATO allies should work toward a division of labor whereby Canada and Europe police the seas adjoining their coasts while the United States supplies the firepower in remote theaters. What purposes would a Pacific-oriented strategy advance? What do Canadians want? At times Canadian leaders sound positively Mahanian about their reasons for a Pacific pivot. If Ottawa covets more trade in Asia, goes their logic, they need to send the fleet. But Mahan was worried about protecting shipping in faraway seas. Canada's navy boasts far too few assets to handle such an ambitious function except as a minor player in an allied effort. Ottawa needs to define its purposes clearly in order to apportion assets wisely and determine whether the nation has amassed enough naval resources to fulfill those purposes. I doubt it. Canada devoted a miserly 1.4 percent of GDP to defense in 2011, well under the bare-bones NATO standard of 2 percent. Ottawa could augment the RCN fleet substantially with that extra 0.6 percent while still remaining on a peacetime footing. That could be money well spent considering the challenges that lie ahead.